On Tuesday a large crowd of at least 150 people gathered at the Shrine of Remembrance here in Melbourne to take part in perhaps the largest of the events to be held in conjunction with the Bomber Command exhibition currently showing at the Shrine. I was particularly looking forward to this one, and it didn’t disappoint. 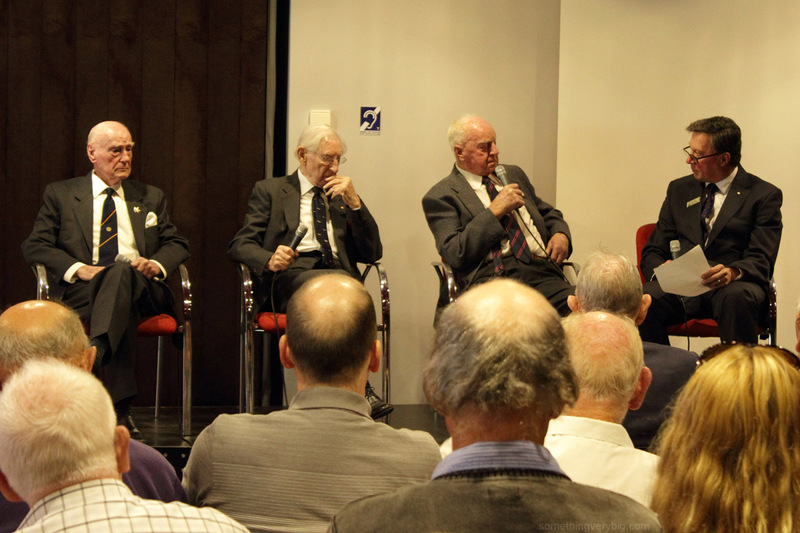 The occasion was a Panel Discussion about Bomber Command, chaired by Air Vice Marshal Chris Spence (Retd), Chairman of the Shrine Trustees. 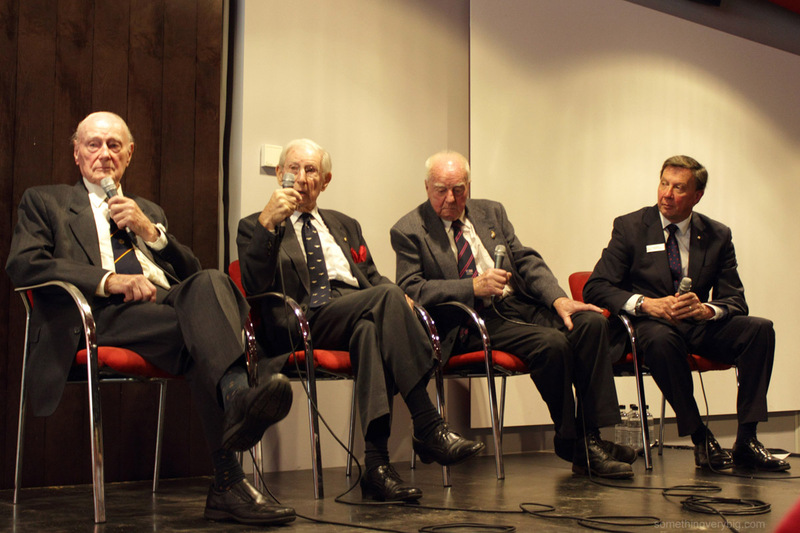 The panel was made up of three veterans, covering the entire period from the beginning of the war to the end. Jack Bell was a Wireless/Air Gunner who served in the Middle East early in the conflict before being shot down in a Bristol Bombay and becoming a prisoner of war in Italy and then in Germany. Peter Isaacson was a Pilot with 460 and 156 Squadrons, later famous as the man who flew Lancaster Q for Queenie to Australia (and under the Sydney Harbour Bridge) on a War Bonds tour in 1943. And Maurie O’Keefe was a Wireless/Air Gunner who served with 460 Squadron at the tail end of the war. The theme continued. Peter related a story of landing a Tiger Moth in a farmer’s field so he could sneak an illicit smoke while at 8 Elementary Flying Training School. Unfortunately he was seen by an overflying aircraft and was as a result confined to barracks, the indiscretion, he said slightly wistfully, “rather spoiling a little romance I had going with a girl in Narrandera…” Once aircrew, always aircrew. But there were also some desperately sad stories. Jack was shot down after his aircraft stumbled over the German 15th Panzer Division in Libya. The navigator was killed in the ensuing crash and, after he returned to Australia following three years, three months and three days as a prisoner of war Jack went to visit his dead crewman’s family. He could see in the mother’s eyes the unasked question, ‘why my son and not you?’ It was, he said, the hardest thing he ever had to do. Following the formal part of the discussion, the microphone was opened to questions from the floor. And there were some very good questions, too. One was relating to Schräge Musik, the fixed upward-firing guns fitted to nightfighters which were so devastatingly effective and utterly unsuspected by Bomber Command until quite late in 1944. What was it like, the questioner asked, to encounter Schräge Musik? Incredibly enough, a first-hand answer was available. 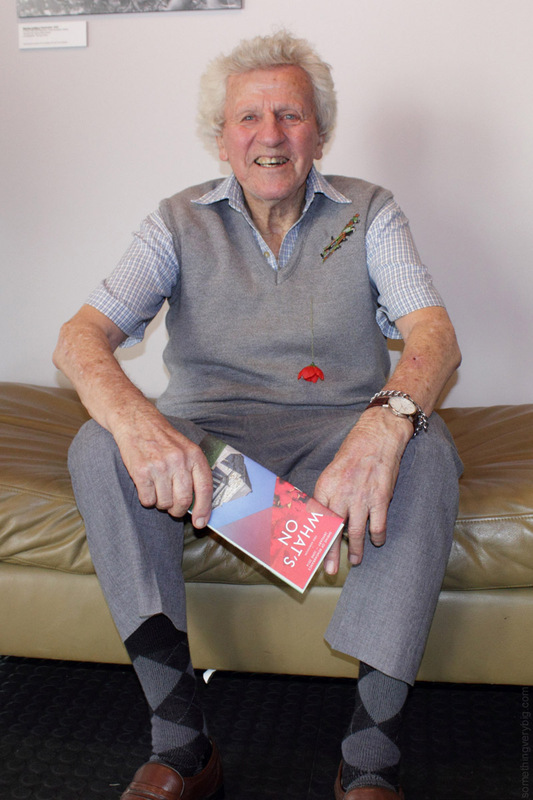 In the audience were at least ten other veterans, and one of these – Jim Cahir – was actually in Stalag Luft III with Jack Bell. Jim’s aircraft was shot down by Schräge Musik over Germany one night. He first became aware of it – “too late, of course” – when shells started hitting his aircraft. Having someone there who, well, was there, gave the answer a real meaning and brought the subject home in a very personal and tangible way. Inevitably at a public event of this nature the discussion eventually turned to Dresden and, as Peter Rees emphasised both in his book and in his talk last week, there were some passionate defences of the rationale and of the attack itself, both from the floor and the panel. The opportunity then arose to mix a little bit over a cup of tea. 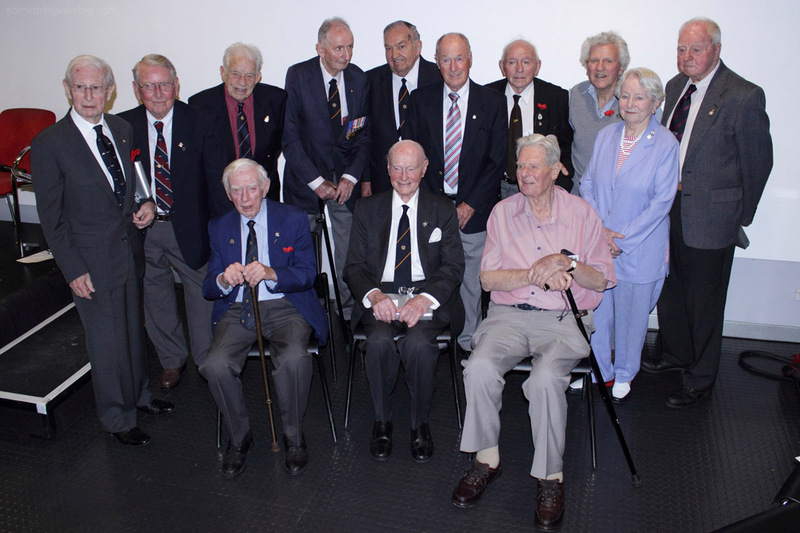 I knew a few veterans (among them Allan Beavis, a Mosquito navigator who I visited at home in Geelong earlier this year) but most were new to me. Most notably, I recognised a tiny golden caterpillar with ruby red eyes on Bill Wilkie’s tie. When I asked him about it he immediately opened his wallet and pulled out his Caterpillar Club membership card, which he carries around with him everywhere even today. He had been a 15 Squadron rear gunner flying out of Mildenhall when his Lancaster was shot down over Germany in January 1945. There were of course other people to see as well. Robyn Bell was there and I finally got to meet Neil Sharkey, the curator at the Shrine responsible for the current Bomber Command exhibition. Happily I was also able meet a man named Geoff Easton. His father was Arnold Easton, a 467 Squadron navigator who was operating at much the same time that my great uncle Jack and his crew were at Waddington. Arnold’s logbook, which I have a copy of, is one of the most precise examples I’ve ever seen and has been a great help in my research so far. But apart from a few emails about five years ago I’d never actually met Geoff. We had a good chat and he offered to send me copies of his late father’s wartime correspondence and a few photos of a very special visit he made recently to what’s left of ‘Old Fred’, Lancaster DV372 in which Arnold completed 20 sorties (and Phil Smith flew at least once), at the Imperial War Museum’s Duxford site. That will be the subject of a future post (it’s a wonderful story). Geoff has since sent me the files and I’m going to enjoy diving into them to see what nuggets come to the surface. The same could be said of the Shrine’s efforts over the last few months. It’s quite strange – but also very encouraging – to see big banners around the city of Melbourne emblazoned with the legend ‘BOMBER COMMAND’ with a photo of a crew in front of a Lancaster. It’s far too late for the vast majority of those who were there, of course, but while we still have some left, events and exhibitions like these allow the stories to be told and the memories to live on. Download a podcast of the discussion from the Shrine website here. When I was young my father showed me a small blue felt-covered notebook. It was the flying logbook of my great uncle Jack, a Lancaster navigator in WWII. Jack's crew was made up of seven young men, all from vastly different backgrounds. They were normal, everyday lads caught up in extraordinary circumstances. This blog charts my search for their story and where it is leading me.